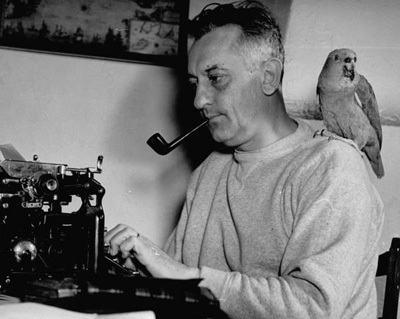 Gene Fowler (born Eugene Devlan) was an American journalist, author and dramatist. He was born in Denver, Colorado. When his mother remarried, young Gene took his stepfather's name to become Gene Fowler. Fowler's career had a false start in taxidermy, which he later claimed permanently gave him a distaste for red meat. After a year at the University of Colorado, he took a job with The Denver Post. His assignments included an interview with frontiersman and Wild West Show promoter Buffalo Bill Cody. He established his trademark impertinence by questioning Cody about his many love affairs. Subsequently, Fowler worked for the New York Daily Mirror, and then became newspaper syndication manager for King Features. His later work included over a dozen screenplays, mostly written in the 1930s, and a number of books including biographies and memoirs. During his years in Hollywood, Fowler became close to such celebrities as John Barrymore and W.C. Fields. Fields, whose animus toward children is legendary, claimed that Gene Fowler's sons were the only children he could stand.